2 nights at Sheraton at the Falls in Niagara. 2 nights at Key Bridge Marriott in Washington DC. 2 nights at Marriott Marquis in New York. • Cave of the Winds. • Enjoy Washington Monuments by Night tour. • See the Indpendence Hall. Choose from a variety of breads, jams, eggs, cereals, fruits, juices, milk, tea and coffee. 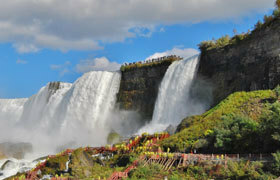 Enjoy Indian Breakfast in New York, Niagara and Las Vegas. Enjoy Veg. / Non-veg. / Jain Meals at Indian Restaurants. Enjoy International Vegetarian / Non-veg lunches in select cities. Single room supplement USD 720 per person.